Working with local volunteer groups, the 3-man team also distributed hygiene essentials including sanitary napkins, bath towels, lungi (sarong)‎ and kidswear to the badly-affected slum community at the Arumbakkam area. These items were procured from the neighbouring state of Bengalore. 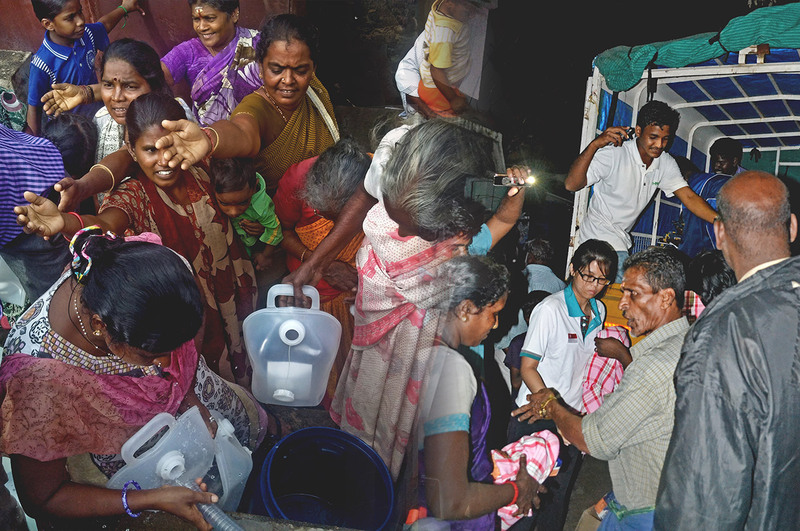 The CCF team arrived in Chennai on Tuesday with half a tonne of relief supplies ‎comprising 4 units of manual-powered water filtration systems, 1000 jerry cans and 2000 disposable underwear to support the local relief efforts as Chennai seeks to recover from the destructive floods. ‎The relief items were flown in complimentary of Singapore Airlines, which resumed its flights to Chennai Tuesday. (left) CCF’s volunteer, Bharath Kumar of HSL Constructor, demonstrating to and training the local volunteer groups at the Kannagi Nagar resettlement area on the use and maintenance of the manual-powered water filtration systems. (centre) Womenfolk at Kannagi Nagar resettlement area collecting potable water using the collapsible jerry cans. (right) A local volunteer acquaints himself with the use and maintenance of the water filtration system. (left) Boy wonders – Water, water everywhere, but just so much to drink. (centre) Several streets in Chennai remain submerged, including this one near the Coovum river. (right) CCF’s volunteers from HSL Constructor, Serena Teo and Bharath Kumar (both in white), working with local volunteers to distribute hygiene essentials to the floods-stricken slum community at the Arumbakkam area‎.